With the rise of popular wearables like the Nike Fuel band and Jawbone Up, and health-based applications for smartphones, personal health is shaping up to be the next major area of innovation for consumer device makers—smartphone manufacturers included. So it’s no surprise that both Samsung and Apple are planning—or reportedly planning—forays into health with its upcoming devices. Samsung is a mere week away from a major health-based press event, and there’s plenty of speculation around Apple’s Healthbook initiative and iOS 8, both of which are expected to be announced in one form or another at their Worldwide Developers Conference in June. Of course, Apple being Apple, the rumors around Healthbook have captured the imagination of the technology press, fueled by supposed screenshots and plenty of speculation around what might be included in iOS 8 as it relates to personal health management. This hit list represents an extensive and thorough biometric tracking system that goes well beyond any wearable on the market today, which is usually Apple’s goal with any launch. However, being able to track information at this granular level will certainly help users take better care of their body through greater awareness of their health indicators, and exercise and diet habits. Here are nine of the most popularly discussed potential features of Healthbook. 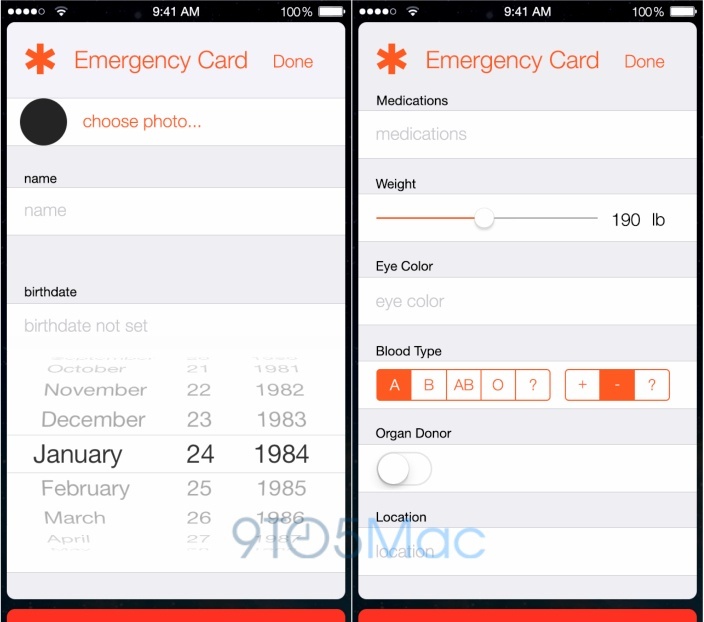 The leaked mockups of HealthBook look much like the card-based interface of Passbook. You can see shots of the screens below. It has horizontal tabs that make it easy for a user to look at and track information including activity, blood pressure, hydration, heart rate, blood work, blood sugar, sleep, respiratory rate, oxygen saturation, and more. You will likely be able to rearrange the tabs to prioritize the information you want to track specifically. It also appears that Healthbook will include an emergency card with useful information like allergies, emergency contacts, blood type and more. This could come in very handy for first responders. This is one of the more unique features of Healthbook, one that will proactively keep you on track with hydration. You can imagine a series of push notifications that act as friendly reminders to stay hydrated. Combined with accelerometer and other biometric data, the iPhone should be reasonably good at making recommendations to keep you hydrated based on activity. This should be especially useful to athletes and those who work out regularly. The app is also rumored to measure respiration rate, but without an external input, this feature would have to be algorithmically driven off of other attributes of the user. The Healthbook will be able to monitor your heart rate and blood pressure. There are plenty of apps that already monitor heart rate, including some through the camera, so building this functionality directly into Healthbook makes a lot of sense. Adding blood pressure is something that would be differentiated from other offerings and could be very useful to those monitoring for fitness or general health management. Sleep monitoring is already a popular app category in the AppStore. Using the phone’s accelerometer to measure restlessness has helped Sleep Cycle become one of the top health apps for the iPhone. Monitoring your sleep cycle is an easy thing for the phone to do when in contact with your mattress and can help you determine how much you are sleeping and how much of that sleep is the restful, deep sleep that you need. Jawbone already tracks sleep of its users as long as the band in worn while sleeping, and it’s not hard to believe that Apple will offer similar tracking through Healthbook. The Healthbook will store and track a variety of different blood work information. At this time, no specific details have been released about this tab in the app, but it is believed that it will help you keep your blood chemistry records in one place and tracked over time. A separate tab, for Blood Sugar, could be a valuable tool for the United States nearly 26 million diabetics to help better manage their blood sugar levels. With detailed blood chemistry and sugar reporting it makes sense that there is a possibility of being able to share data directly with your doctor. Of course apps that tie into Healthbook with the desire to pass their information to HIPAA covered entities in the States will need to be HIPAA compliant themselves. Developers of existing apps can quickly and easily become HIPAA compliant by storing private health information (PHI) in TrueVault. Pulse oximeters have slowly made their way out of hospitals and into homes, and if Healthbook is any indication, the technology may soon be available on our phones. The amount of oxygen in your bloodstream is a key vital sign, because low oxygen saturation means you aren’t getting vital nutrients to your heart and brain. An onboard “PulseOx” could be helpful for everyone from hikers and those who will be in high elevations to those recovering from surgery or battling other difficult diseases. The digital emergency card that appears to be included in Healthbook could be invaluable to first responders in the case of a medical emergency. Leaked views of it show that it will include important information, like your name, picture, blood type, birthdate, weight, eye color, and whether or not you are an organ donor. It will also include any medications you take and your home address. As a diabetic myself, having this information handy in the event of a debilitating sugar low could be lifesaving. In fact, it seems so valuable it’s now hard to believe it hasn’t been a fixture on smartphones from the beginning. While the latest rumors suggest we won’t see the iWatch at the upcoming WWDC, it seems pretty clear that any such connected device would integrate into Healthbook so that you can track your health and activity right from your wrist. It seems like any blood pressure monitoring would need to come from the watch as well. Nike, who recently cancelled the development of future Fuelband hardware, may be a key player in the software that launches on the watch or as a launch partner for Healthbook in general at the WWDC in June. The Apple Healthbook is certainly an exciting development in consumer health management, particularly if it delivers on the promise of the advanced tracking alluded to in the screenshots. If Healthbook ships with just a portion of this tracking capability it will go above and beyond any current fitness apps that are available today. By helping users store and manage all information in one place means a greater likelihood of tracking, awareness and prescribed care compliance. Ultimately it could mean easier, more convenient health records that give healthcare providers greater insights that inform and improve patient care. 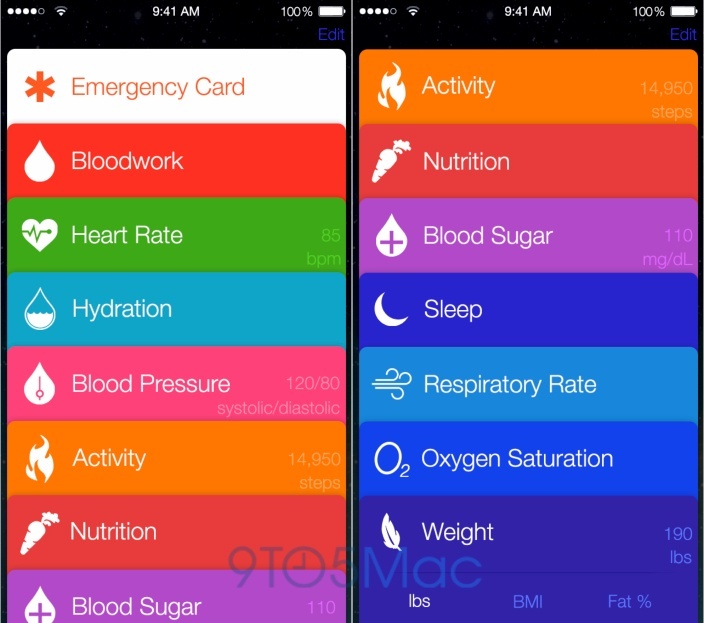 With WWDC a few weeks away, it’s likely that more information about iOS 8 as well as Healthbook itself will surface as we get close to the conference. And we’ll check back in after the Worldwide Developers Conference to see how well the rumors stack up to what Apple will announce. What do you think? Is it going to be a personal health game changer, or is it over hyped speculation? Let us know on Twitter at @TrueVault.